Trump Family Christmas Card Has Conservatives cheering, nothing like the Obamas’ secular doggie romps in the snow. No word yet on what the Trump Administration’s Christmas card will be, but of one thing we can be assured: no black dog prancing about in the snow or Mao Tse Tung ornaments on the White House Christmas Tree. And for that we can all be thankful. 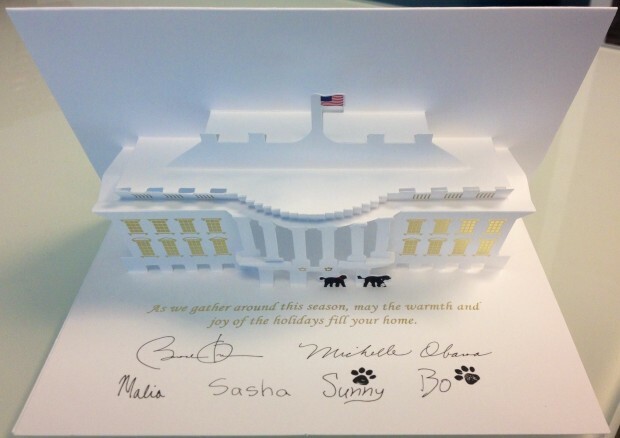 Bo and Sunny were placed front and center on the Obama’s 2014 Official Christmas Card. Emily painted the North Entry Hall of the White House featuring the presidential pets. 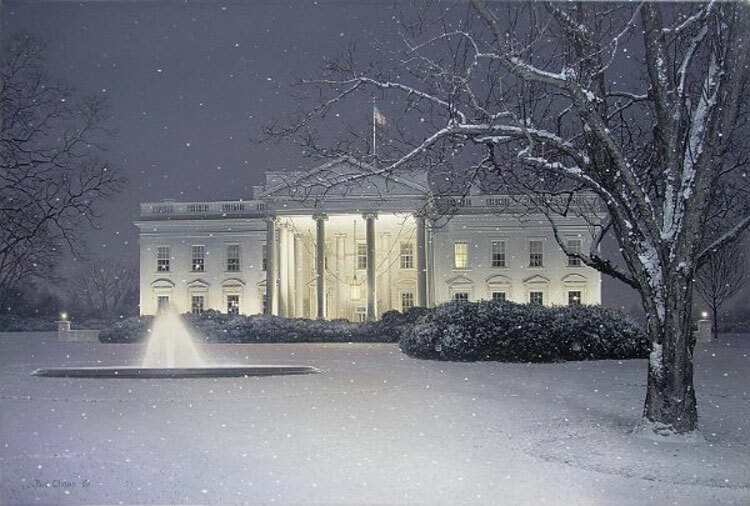 We don’t know yet what this year’s official White House Christmas — oops — “holiday” card will look like, although we do have an idea it might be this one, commissioned by the White House Historical Association and painted by John Hutton, 53, an associate professor of art history and professional illustrator. The scene depicts a tribute to America’s first socialist president Woodrow Wilson. Apropos, wouldn’t you say? Though the Whitehouse.gov website has not yet officially announced the annual White House card design, we can be pretty sure it’ll be this one, given the subject – a socialist president and his sheep. 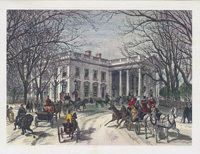 “This year’s watercolor card features a serene, pastoral scene on the front lawn of the White House on Christmas in 1913. All the details of the painting are historically accurate, from the elm tree Wilson planted in the front lawn to signify hope as Europe teetered on the edge of World War I, to the little sheep looking out into the snowy landscape. And the sheep served a practical purpose, Hutton said. 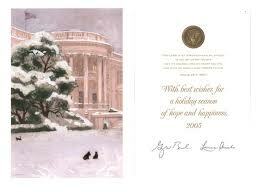 Here is my favorite, though it was never an official White House Christmas card. It should have been, don’t you think? 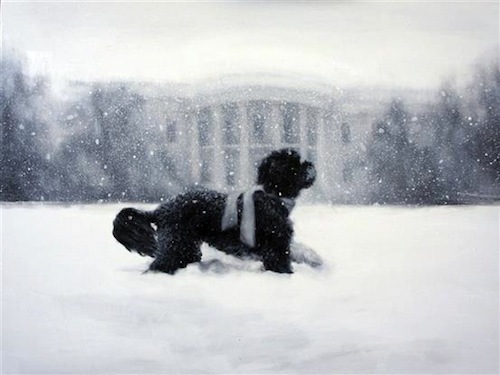 Above is the 2012 White House Christmas card featuring a painting by Iowa artist Larassa Kabel of the dog Bo running across the White House’s north lawn. Unless Bo is a reincarnation of the Christ Child and I missed it, there is absolutely no symbol of the reason for the season. This could have been — and probably was — inspired by a snapshot taken by White House photographer on a fun frolic through the snow. According to an article written in Presidential Memorabilia, there have been official greeting cards from the White House for more than half a century, going out to a select number of people for the holidays. I’ve reprinted the article and added illustrations so you can enjoy a Christmas season trip down America’s White House memory lane. 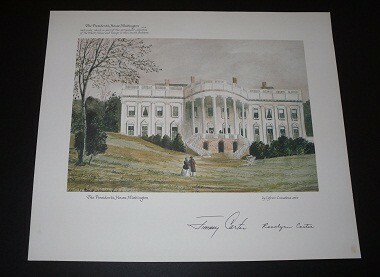 Sketch of 1860 White House featured on President Jimmy Carter greetings card. 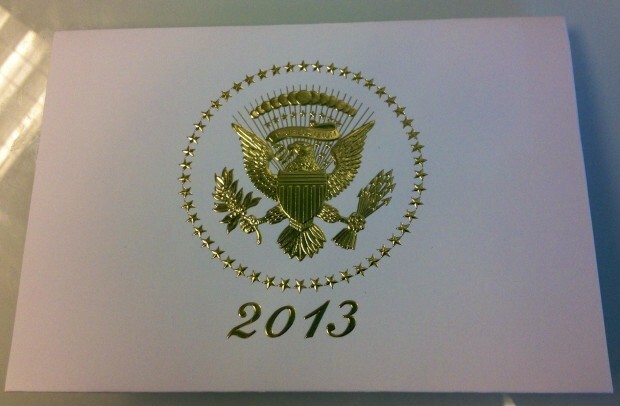 It must be quite a thrill to actually receive a Christmas card from the President of the United States. 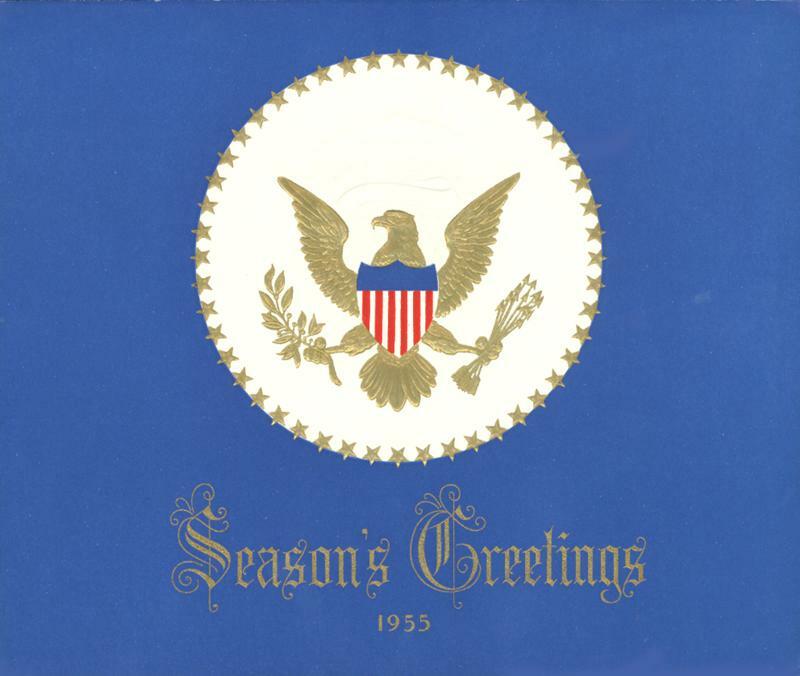 For more than half a century there have been official greeting cards from the White House going out to a select number of people for the holidays. The traditional practice has endured through bright days and dark days, through times of peace and times of conflict. 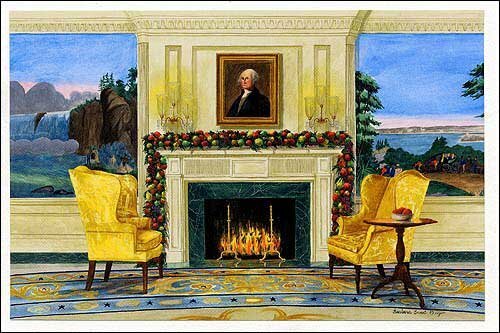 Today the Christmas cards of presidents past are a significant area of holiday collectibles. Historians do not fully agree on exactly when the custom began. President Calvin Coolidge issued the first official Christmas message to the American people in the 1920s according to sources at the White House. 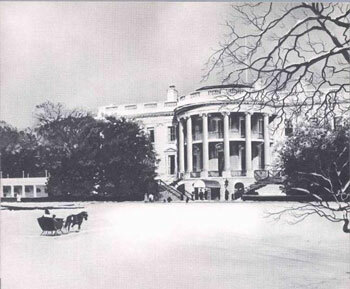 Coolidge also participated in the first Christmas tree lighting ceremony at the White House. In 1923 the first event was known as the Pageant of Peace. 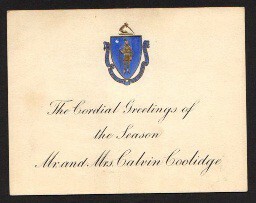 Some sources say Coolidge was actually sending out a few Christmas greeting cards from the White House by 1927. 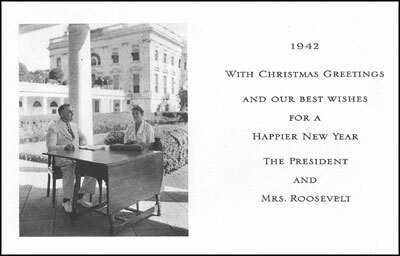 White House officials and most historians agree that President Herbert Hoover clearly was sending out holiday greetings from the executive residence by the early 1930s. 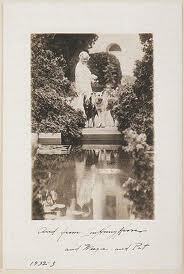 In 1931 the president and Mrs. Hoover reproduced favorite family photographs for family, friends, and staff. 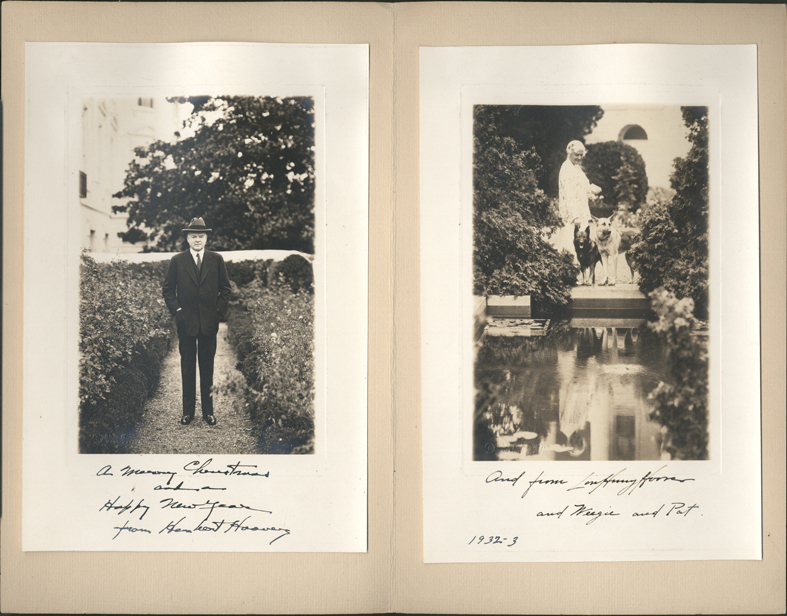 As an added touch Hoover personalized the holiday greetings photographs with hand-written messages in the margins. 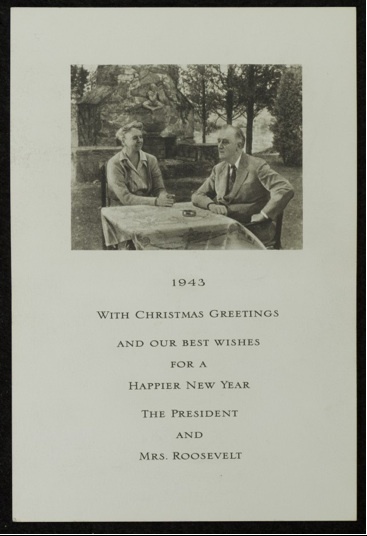 Franklin Delano Roosevelt introduced more of a stylized Christmas card in 1937 which was provided by the distinguished Brewood Engravers. The single-sided FDR offering was a small, three by four inch lithograph of a snow-covered farm with two red barns and two green fir trees. 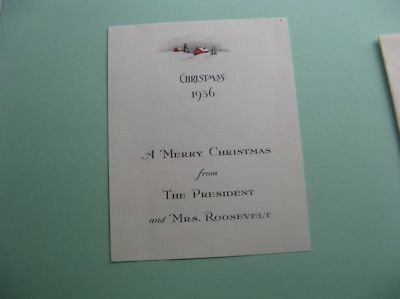 The inscription said simply, “Christmas 1937.” Basically the Christmas cards remained unchanged for the next several years, except for updating the numbers of the year. 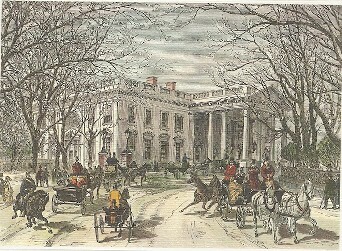 American Greetings produced greetings card with White House sketch of 1877 for one holiday season. The following year as World War II raged on around the world, the Roosevelts selected a different photograph but the same type of greeting. In the 1943 version, the couple was seated outside at a cloth-covered table. The photograph was taken by Ralph Short of Poughkeepsie, New York. 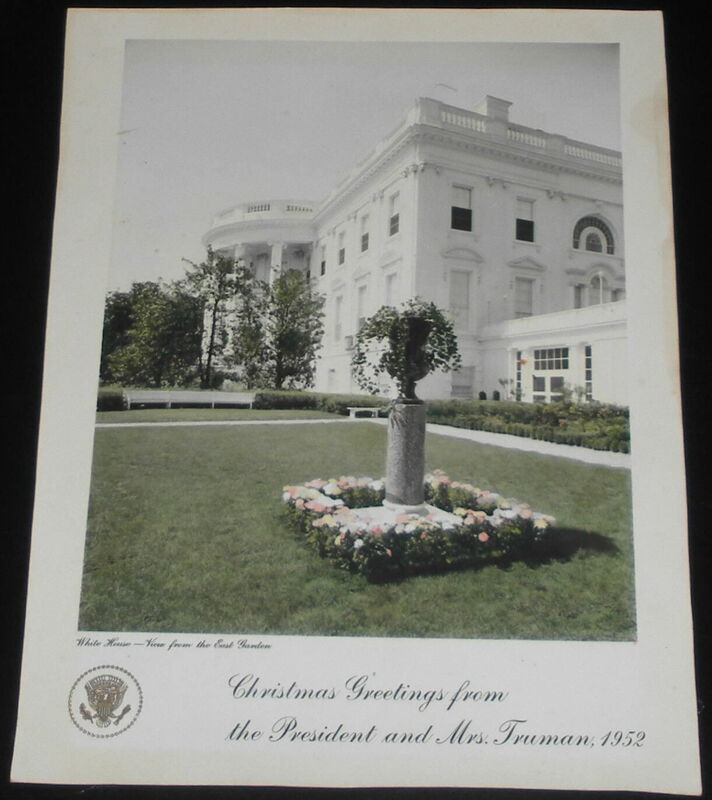 When President Harry Truman occupied the White House in the latter 1940s and early 1950s there were two sizes of Christmas greetings distributed on behalf of the family. The larger cards were reportedly given out on a much more limited basis, although both would be consider by collectors to be quite scarce today. 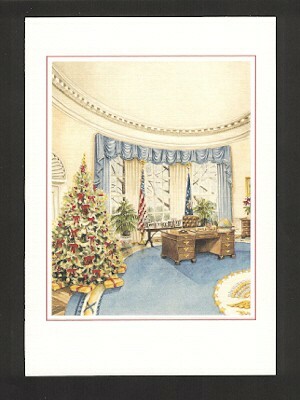 The Truman Presidential Christmas Card from 1950 (above) is one of the most scarce of the large Presidential Christmas Cards. Beautifully calligraphed on heavy stock, the signatures of the President and First Lady were printed. 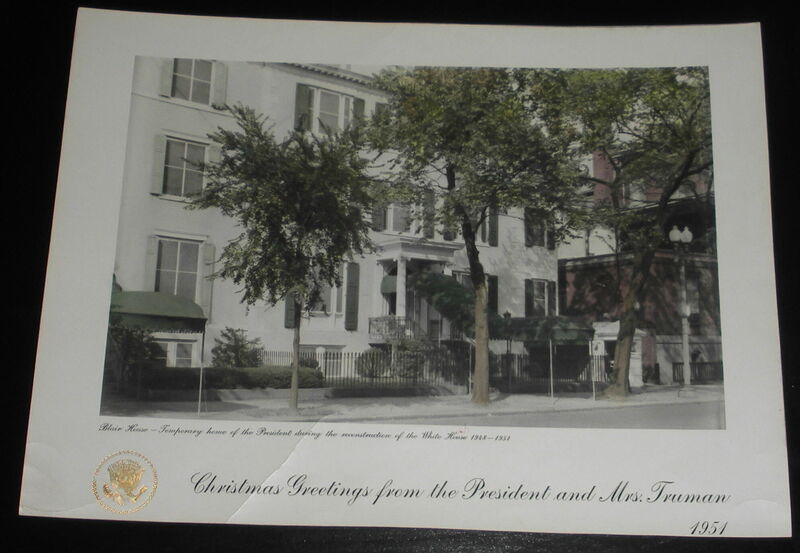 In 1951 the president and Mrs. Truman used a Christmas card with a photograph of Blair House to send their traditional greetings. The first couple lived there from November of 1948 until March of 1951 while the White House was under extensive renovation. 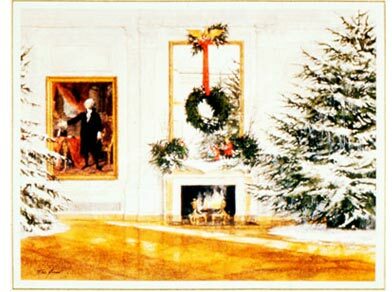 It is generally acknowledged that the first official White House Christmas greeting card came under the administration of Dwight D. Eisenhower. Starting in 1953 “Ike” make the impressive Presidential Seal the dominant part of the White House card. The mailing list was expanded considerably to include members of the Cabinet, members of Congress, American ambassadors aboard, and foreign heads of state. That year 1,100 cards were dispatched. 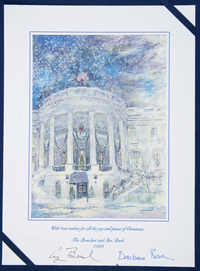 From that point on according to authorities in the nation’s capital, the official Presidential Holiday Greeting became the White House Christmas card. President Eisenhower designated one of the nation’s leading greeting card makers, Hallmark, to produce the first official card in 1953. Since that time Hallmark has produced more than 35 different White House greetings cards. Also in 1961, Mrs. Kennedy had the above card made. 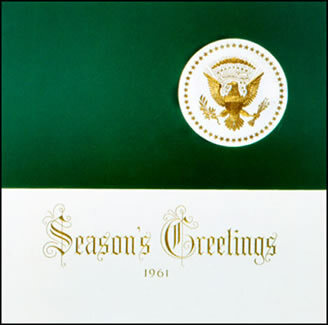 It is a large 1961 Christmas Card from the Kennedy’s first year in the White House. It features a photograph by White House photographer Cecil Stoughton of ducks in a pond. This photograph was a favorite of Jacqueline Kennedy, and she made the decision to feature it on the Christmas Card which measured approximately 14 X 17 inches. 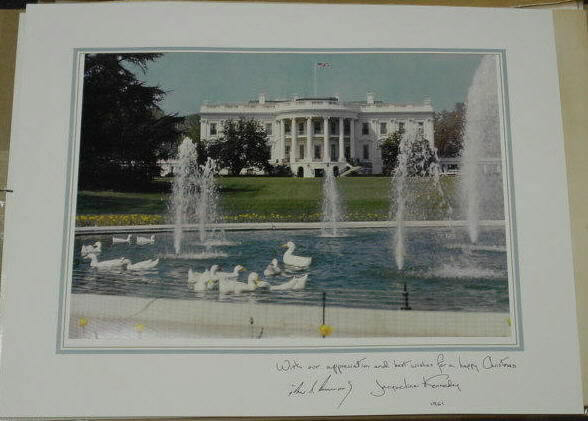 The inscription at the bottom of the card read, “With our appreciation and best wishes for a happy Christmas,” and carried the printed signatures of John Kennedy and Jacqueline Kennedy and the year 1961. The maker of the card is Hallmark. 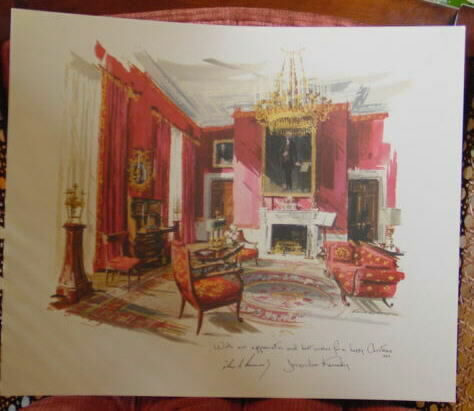 The Kennedy 1962 Christmas Card depicted the Red Room of the White House. 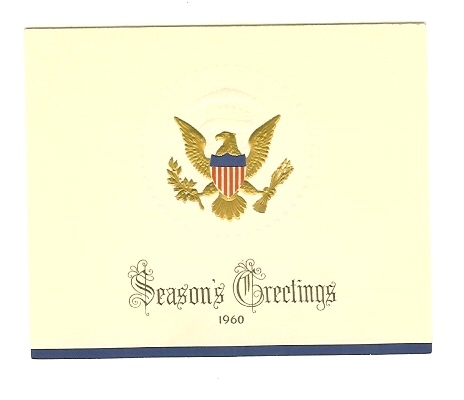 Inscribed “With our appreciation and best wishes for a happy Christmas 1962,” it bore the printed signatures of President Kennedy and Jacqueline Kennedy. Also in 1962, the White House Christmas Card/Photo courtesy of John F. Kennedy Presidential Library and Museum, Boston, Massachusetts. 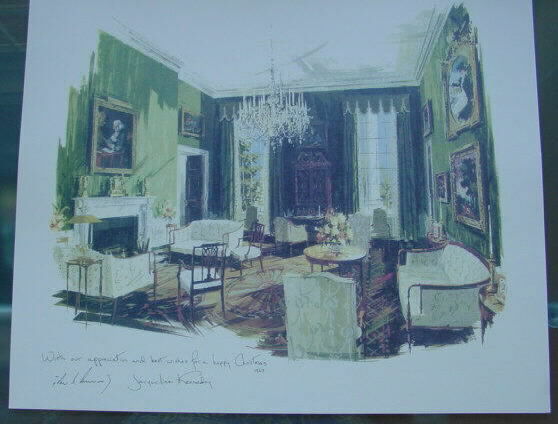 The 1963 JFK Christmas card depicted the Green Room at the White House and featured the sentiment, “With our appreciation and best wishes for a happy Christmas 1963”. 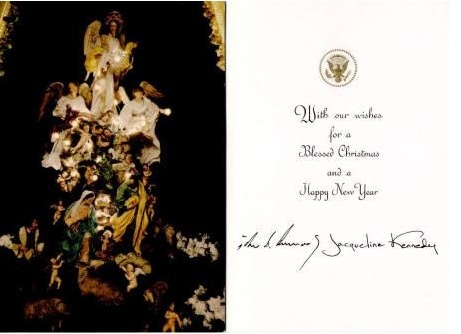 This was the last of the Kennedy Christmas cards and was given by Jacqueline to VIPS and Senior White House Staff after the death of President Kennedy. 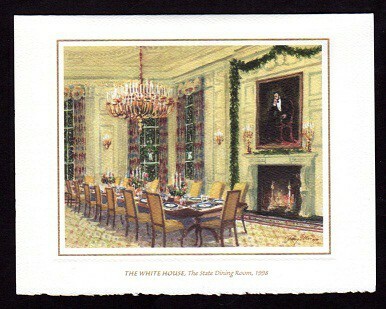 Coming at a tragic time in the nation’s history the White House Christmas card in December 1963 was starkly white except for a thin red border at the bottom. 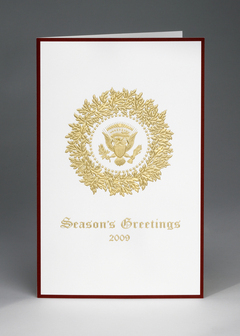 Although the card was embossed by the Presidential Seal, the card contained no additional color and no holiday symbol. Two variations of two-word messages were used inside. One said “Blessed Christmas” while others read “Season’s Greetings.” Newly sworn-in president Lyndon Johnson and Mrs. Johnson actually sent the cards during the official mourning period following the November 22 assassination of President John Kennedy. (Seen above, a similar version was sent out in 2009). According to Mary Evans Seeley, author of “Season’s Greetings From the White House,” a memo from the United States Department’s chief of protocol just five days after JFK’s death prompted the Johnsons to continue the tradition despite the circumstances. In any event, the list that holiday season was significantly limited and included a relatively few governmental leaders in the United States and abroad. This is a beautiful card displaying trees, landscape, two girls representing the Johnson daughters, two dogs representing the Johnson pets, and a view of the White House. The card was frequently referred to as The Willow Watercolor. 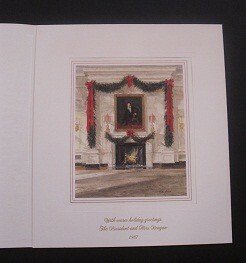 Robert H. Laessig painted the card and American Greetings made and supplied the cards to the White House without charge. 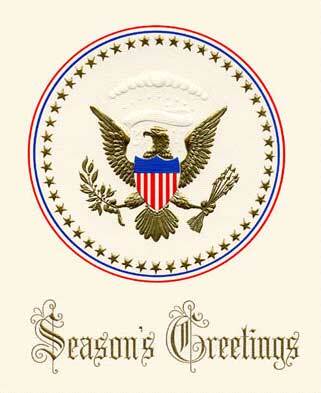 By 1967 the Johnsons had returned to more festive White House greeting cards. 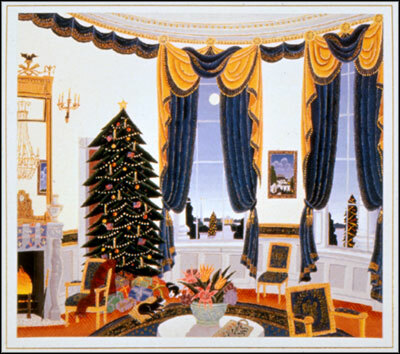 That year the cards included a reproduction of an interior painting of a Christmas tree in the Blue Room by artist Robert Laessig. The holiday cards were sent to 2,600 people. President Richard Nixon and Mrs. Nixon found the idea of reproducing a vintage painting on White House cards appealing as well. In 1971 their selection was the reproduction of a 1930 painting by N.C. Wyeth. Originally the Wyeth work had been used as a patriotic poster commissioned by the Pennsylvania Railroad. 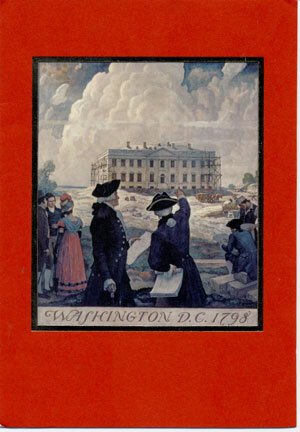 The painting itself depicted President George Washington and architect James Hoban as they inspected the uncompleted White House in 1798. 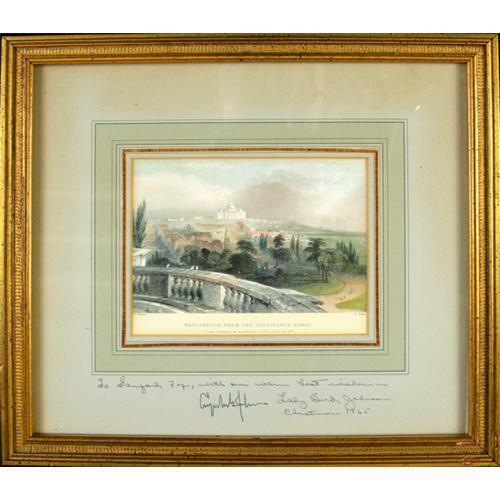 A few years later in 1975, President Gerald Ford and Mrs. Ford selected a 1858 painting by George H. Durrie for the official White House greetings card. 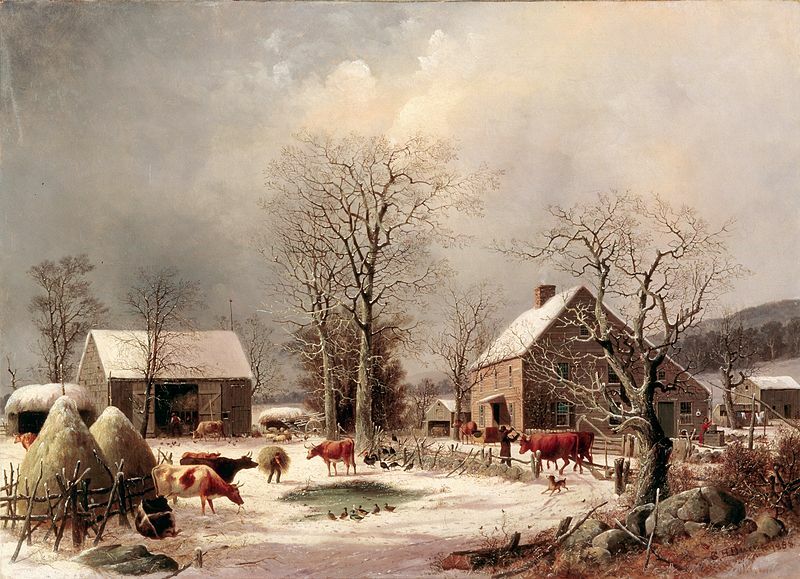 The painting, called Farmyard in Winter, was framed in red foil and represented what many considered to be an old-fashioned Christmas scene. 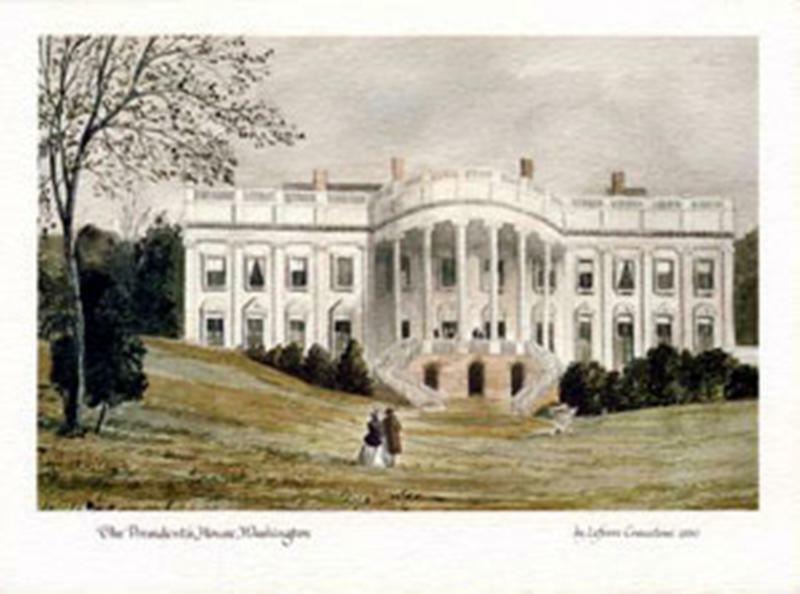 The Carters decided on a unique 1860 sketch of the historic White House for the 1979 greeting cards. That particular year they were also produced by American Greetings. 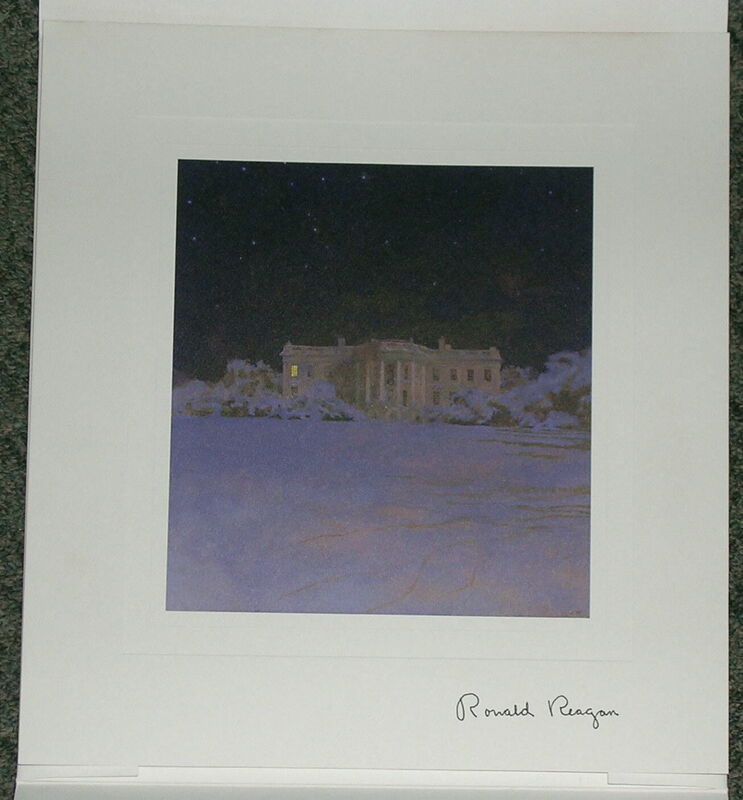 In 1981 President Ronald Reagan and Mrs. Reagan chose a painting by artist Jamie Wyeth as focus of the annual cards. 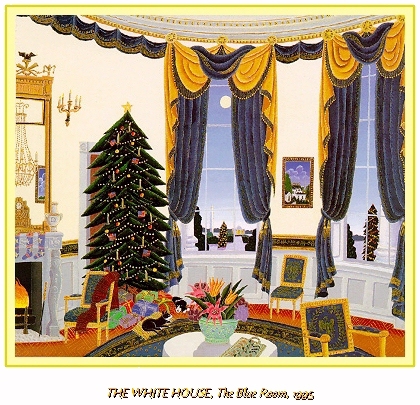 Appropriately, the title of the original painting was Christmas Eve at the White House. 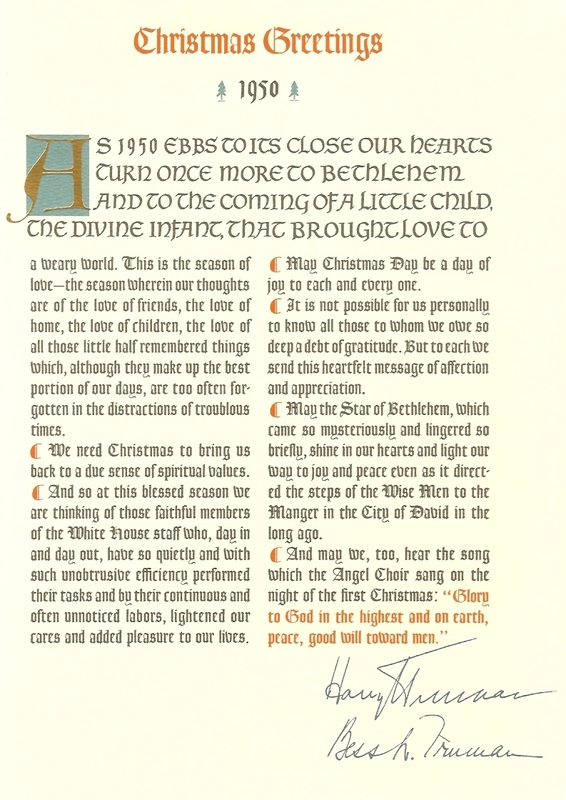 The Hallmark-made card that year was issued in two sizes with the larger 11.5 by 12 inch version being sent to a much more limited and selective list. the State Dining Room in 1987, and the North Entry Hall in 1988. The first of the President George H.W. 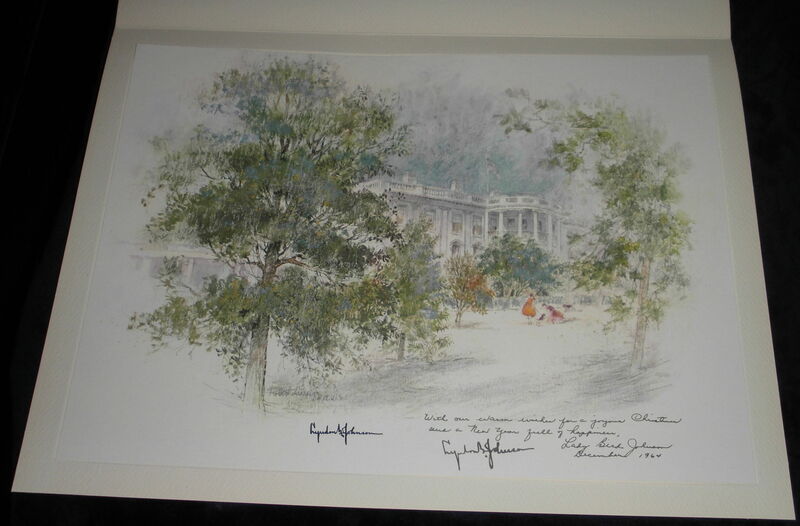 Bush’s official greetings cards in 1989 featured a painting by William Gemmell. 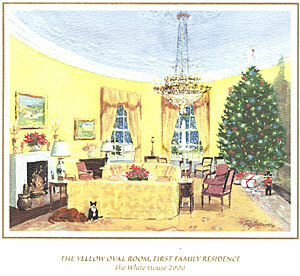 The title of the painting, Celebrating Christmas at the President’s House, was included on the card’s image. The White House cards that year were also issued in two sizes with the larger 12 by 16 inch version being the most restricted in number. 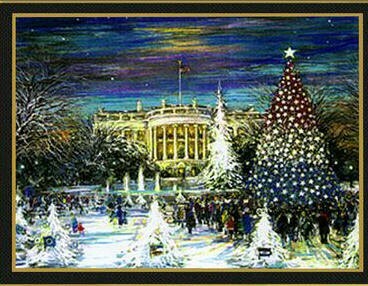 The official White House Christmas Card for 1992 from the President and Mrs. Bush was produced for the White House by Hallmark Cards. The design on the cover was the national tree and the White House by Kamil Kubik. 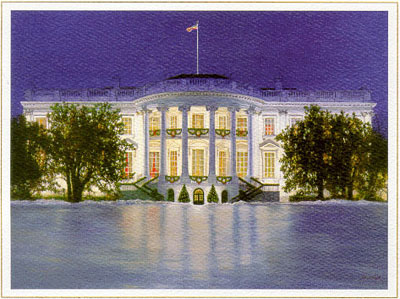 Official White House Christmas Card from 1998. From Bill Clinton and Hillary Clinton. The White House – The State Dining Room. Watercolor by Ray Ellis. President William Clinton and Mrs. Clinton returned to the interior of the White House for their 1995 White House greetings cards. 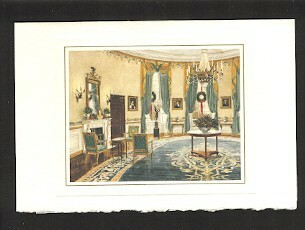 The White House Blue Room was rendered by artist Thomas McKnight who also provided the artwork for the cards the previous year and the year afterwards. 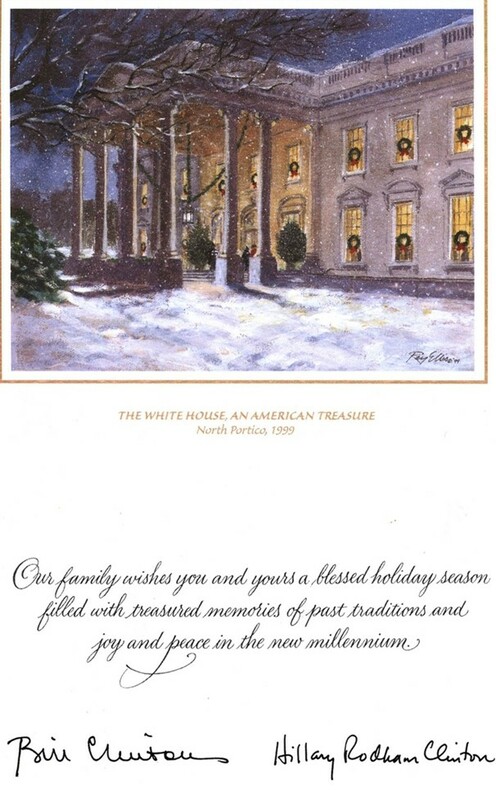 The Clintons welcomed “…joy and peace in new millennium” with their 1999 White House greeting card. 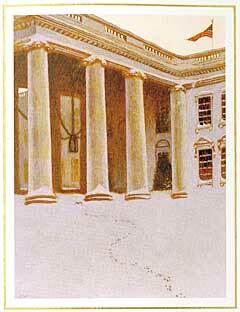 The card depicted a snow covered North Portico of the White House based on a watercolor by Ray Ellis. The cards were mailed to an estimated 400,000 people. 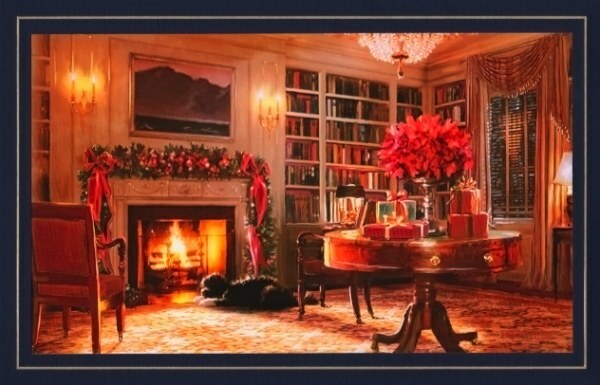 President George W. Bush and Mrs. Laura Bush picked a “cozy corner” for their 2001 official first family Christmas card. 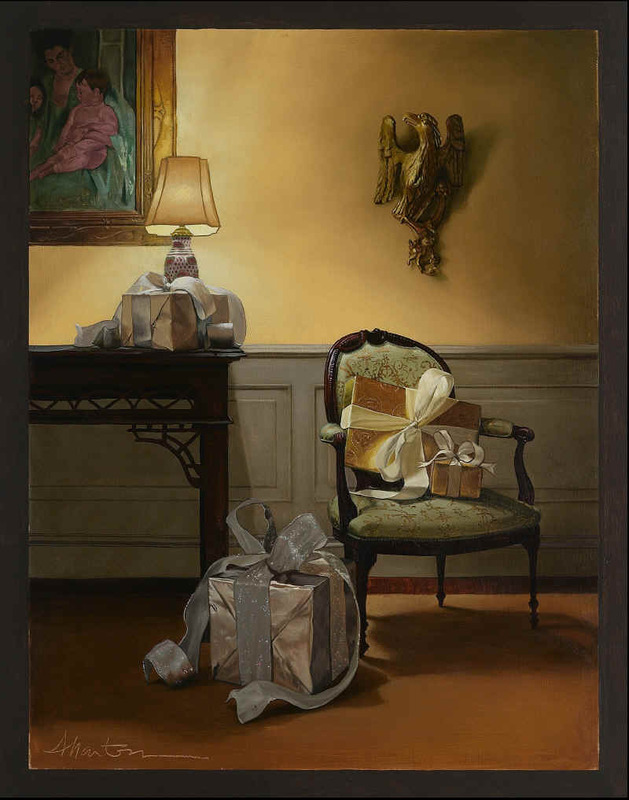 It featured attractively wrapped packages inside the second floor corridor of the White House. Hanging on the wall in the back of the image was a section of the painting Young Woman and Two Children by Mary Cassatt. 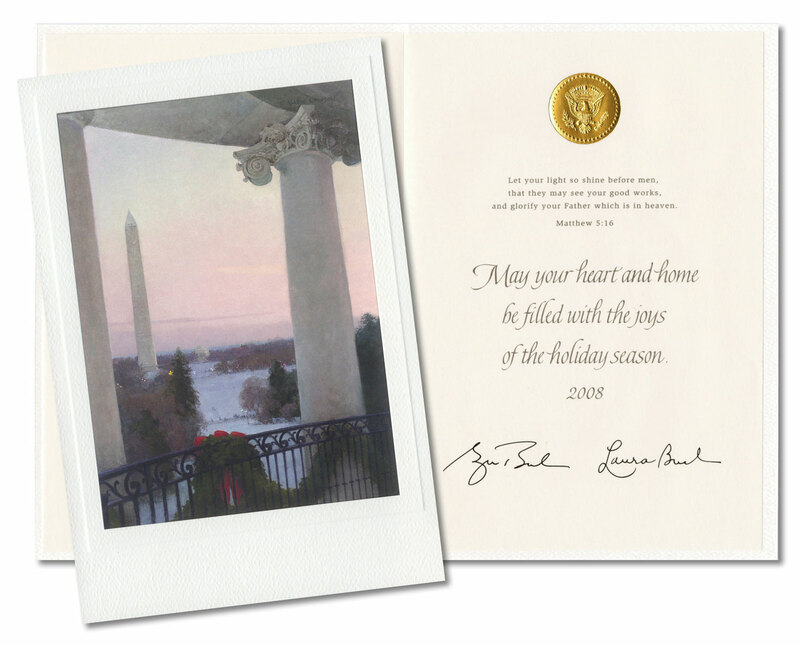 The Bush holiday greetings card had a mailing of 875,000. 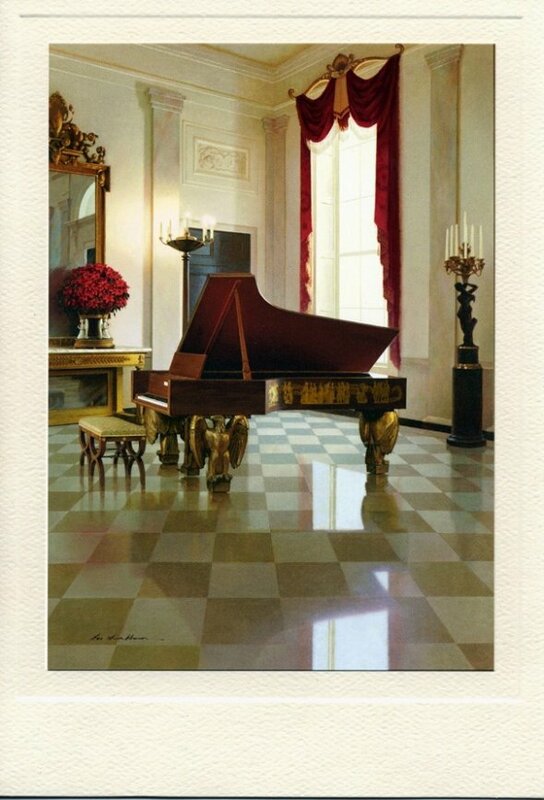 In 2002 the president and Mrs. Bush selected an oil painting of a 1938 Steinway grand piano in the Grand Foyer of the White House to ‘decorate’ their official card. This time the mailing reached an all-time presidential record of one million Christmas cards. And ironically the inscriptions on the cards had long since ceased the use of the word Christmas. The 2007 card a watercolor snow scene created by artist David Drummond with the statue “Gardner” by Sylvia Shaw Judson overlooking the pond in the Jackie Kennedy Garden near the East Wing colonnade. Inside is a religious quotation from Nehemiah 9:16 and the printed signatures of President George W. Bush and First Lady Laura Bush. That year — 2007 — the New York Times estimated that the postage alone, a 37-cent American flag stamp on each, would reach $370,000. However in recent decades, the enormous expense and effort of such mailings has been borne by the political party of the person who was in office at the time. 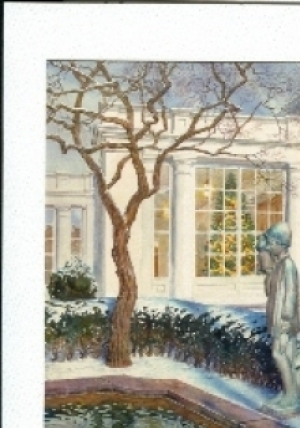 Back in 1982 the legendary Hallmark company donated its extraordinary Presidential Christmas Card collection to the National Museum of American History, a part of the Smithsonian Institution. However, many truly authentic White House greetings card remain. Reblogged this on Knucklebones Radio. Pingback: A gift to bring, fit to give the king?